A ventriculoperitoneal (VP) shunt is a commonly performed surgical procedure for hydrocephalus of different etiologies. Various complications of VP shunt are well-described in the literature., We report a rare complication of this common procedure, which involved the formation of an umbilical cerebrospinal fluid (CSF) fistula that was demonstrated on imaging of the abdomen. 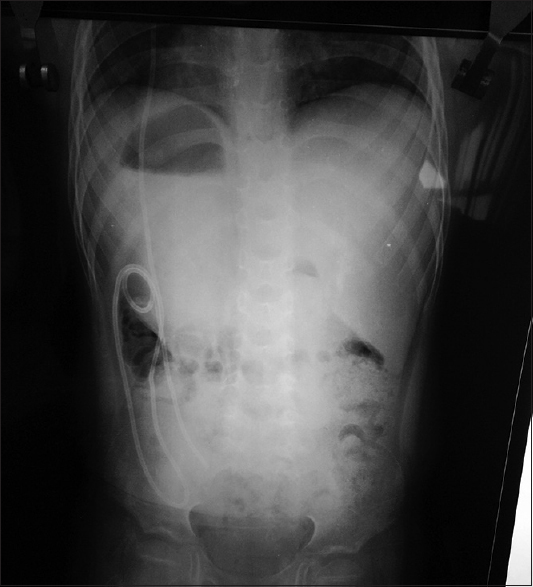 A 6-year old girl was admitted to our department with a history of clear fluid leaking through the umbilicus for the past 7 days. This was associated with fever. The clinical history revealed insertion of a VP shunt 6 months ago for obstructive hydrocephalus. There was no history of a congenital or acquired abnormality or discharge related to the umbilicus. On examination of the abdominal end of the shunt, egress of clear fluid through the umbilicus was evident [Figure 1]a, although the shunt catheter could neither be seen nor palpated per abdomen. The umbilicus itself appeared normal. Computed tomography (CT) scan of the brain showed hydrocephalus. X-ray of the abdomen [Figure 1] was done that revealed the shunt track. Ultrasound of the abdomen did not reveal any intra-abdominal fluid collection. Analysis of the leaking fluid confirmed it to be CSF with evidence of infection. Antibiotics based on culture and sensitivity reports were administered for the next 7 days. As the infection subsided, as evident by three repeated normal CSF examinations and normal culture reports, the patient was operated for the displaced distal tip of the shunt, wherein adhesions were released, and the peritoneal end of the shunt was placed into the right sub-hepatic area of the abdomen. The patient was discharged on the 10th postoperative day and the follow-up showed absence of any leak. There was subsidence of hydrocephalus. It is difficult to speculate on the likely cause of the fistulous communication between the peritoneal end of the shunt and umbilicus in the present case as the patient neither had any evidence of infection nor of shunt obstruction before the unique presentation of fluid discharge through the umbilicus. Infection may probably have been a causative factor resulting in the adhesion of the shunt tube to the urachal remnant, later resulting in a fistula, possibly due to distal CSF flow obstruction (secondary to the underlying infection). X-ray of the abdomen clearly revealed the shunt tract [Figure 1], while clear fluid discharge from the umbilicus is seen in [Figure 2]. As far as management of such cases is considered, a persistent omphalomesentric tract, when identified, should be operated upon and closed to prevent late complications. The principles of management of such rare fistulae are similar to that being carried out in the other commoner types of shunt malfunctions, consisting mainly of proximal diversion of the leaking fluid, as was done in this case, which results in the healing and closure of the fistula [Figure 3]. Therefore, it is important for clinicians to be aware of this complication. An early detection of these umbilical discharges after a VP shunt will enable the initiaiton of an early management. 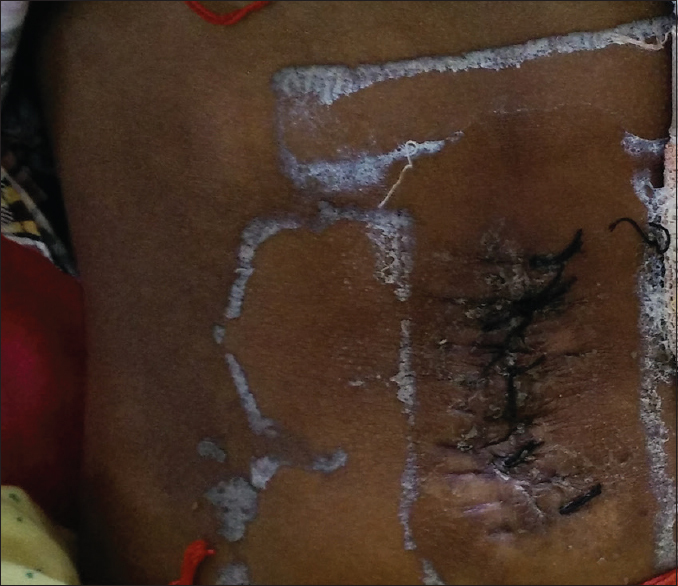 Gupta A, Ahmad FU, Kumar A, Gaikwad S, Vaishya S. Umbilical CSF fistula: A rare complication of ventriculoperitoneal shunt. Acta Neurochir (Wien) 2006;148:1205-7. Chatterjee S, Harischandra L. Cerebrospinal fluid shunts – How they work: The basics. Neurol India 2018;66:24-35. Antunes AC, Ribeirio TR. Spontaneous CSF fistula from ventriculoperitoneal shunt drainage. Report of two cases. J Neurosurg 1975;43:481-2. Das PC, Radhakrishna K, Rao PL. Spontaneous CSF fistula: A rare complication of ventriculoperitoneal shunt. J Pediatr Surg 1993;28:630-1. Pomplili A, Cianfriglia F. Umblical fistula as a complication of ventriculo-peritoneal shunt. Surg Neurol 1979;12:129-30. Woon K, Yap Y, Cartmill M. Spontaneous umbilical CSF fistula in an adult as a complication of a ventriculoperitoneal shunt. Br J Neurosurg 2006;20:244-6. Eser O, Dogru O, Aslan A, Kundak AA. 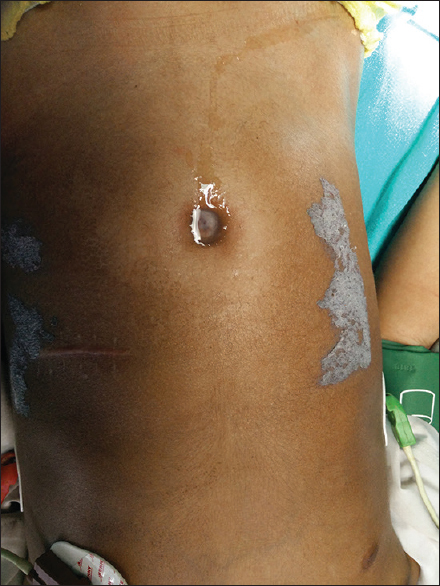 Umbilical perforation: An unusual complication of a ventriculoperitoneal shunt. Childs Nerv Syst 2006;22:1509-10. Mohindra S, Singla N, Gupta R, Gupta SK. CSF fistula through the umbilicus following a shunt surgery: A case report and literature review. Pediatr Neurosurg 2007;43:396-8. Ardalan M, Rafati AH, Nejat F, Khashab ME. Umbilical hernia and ventriculoperitoneal shunt complications. Iran J Pediatr 2011;20:127-8. Wani AA, Ramzan A, Wani MA Protrusion of a peritoneal catheter through the umblicus: An unusual complication of a ventriculoperitoneal shunt. Pediatr Surg Int 2002;18:171-2.